Welcome to the OHJA web site! 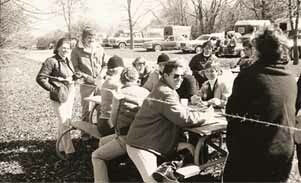 In the summer of 1980, during the Cincinnati Horse Show held at Lebanon Raceway, a large group of Ohio hunter trainers and exhibitors met to discuss the Horse Show industry in our area. The biggest concern discussed was the lack of a venue for Ohio exhibitors to achieve some kind of gratification for exhibiting their horses. At that time one either persued the big "A" shows or traveled to shows in the Tri-State Association schedule, which encompassed Ohio, Indiana, and Kentucky. Kentucky had formed it's own association in the mid 60's. So the group assembled at that meeting decided we would form our own Ohio association following the concept of AHSA; but also including more divisions for beginner and novice horses and riders. Thus the birth of the Ohio Hunter Jumper Association. Our goal was to schedule a circuit of then B-rated shows within the the Ohio radius where exhibitors could garner points toward end of the year awards. I think we proved to be very successful and the membership seemed satisfied. Since that time the Association has continued to grow in it's membership and the number of member shows that are scheduled yearly. I'm sure that this success will continue for many more years.